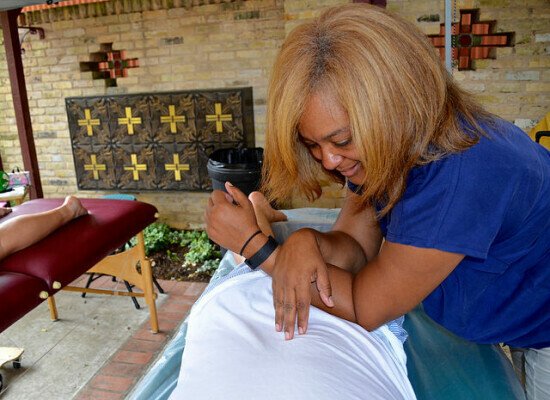 Twenty years ago, Pinky Wilson, a member of St. James’, LaGrange, began a ministry of hospitality to riders in the annual Houston-Austin MS150, through her position at the Jabboury Foundation, a Houston cancer research organization. 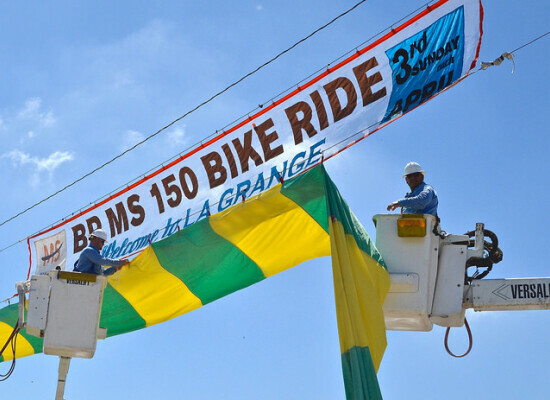 Riders stop overnight in LaGrange during the two-day event, and unless they have made more comfortable arrangements, sleep in tents at the local fairgrounds. Wilson helped the Foundation find local partners, including St. James’, to provide homes, ranches and church facilities to host riders, provide meals and a place to sleep. Additionally, Wilson held a popular reception at her historic home across the street from St. James’, which was sponsored by the Foundation. 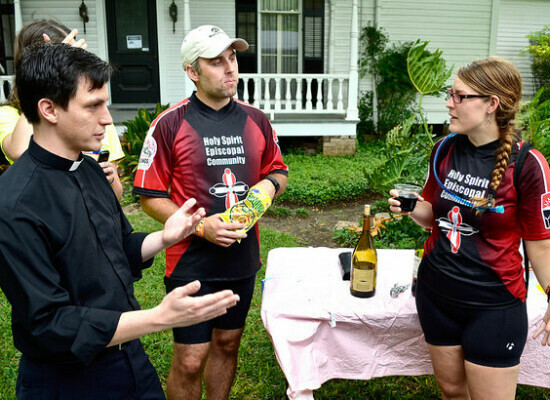 “It was all Pinky’s idea,” said Joe Bailey, president of the St. James’ Episcopal Men’s Club, and last year’s chair of the church’s MS150 event. Riders gather at Wilson’s house at the end of their first day’s ride and check in to meet their host family. A band and refreshments lend to the party atmosphere. “Host families provide a hot shower, a cold beer and facilities to wash riding gear along with supper and a bed,” Bailey explained. 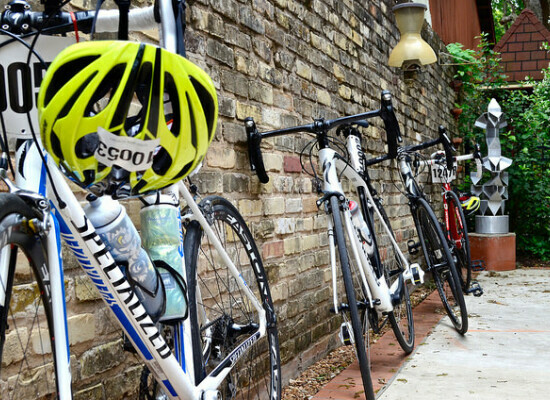 The following morning, after a comfortable night’s sleep, hosts provide an early breakfast—usually around 5 a.m.—and a ride to the fairgrounds, where riders begin the final leg of their journey. “It’s a win-win for us,” Wilson said. “We are able to benefit so many people through this ministry and we have gotten new members in the process. It’s [also] wonderful to see churches from the LaGrange community come together to host this event,” she added. Bailey said church members with pickups help to move bicycles, while some of the bikes are locked up in Wilson’s garage overnight. Her historic home was originally built in the 1860s by Senator Kay Bailey Hutchinson’s grandfather. Many corporate teams—sometimes several hundred people—prefer to stay together at the fairgrounds in tents sponsored by their companies, where their catered meals are served and bedrolls provided. Every B&B and hotel in Fayette County and beyond are booked a year in advance, Bailey said. 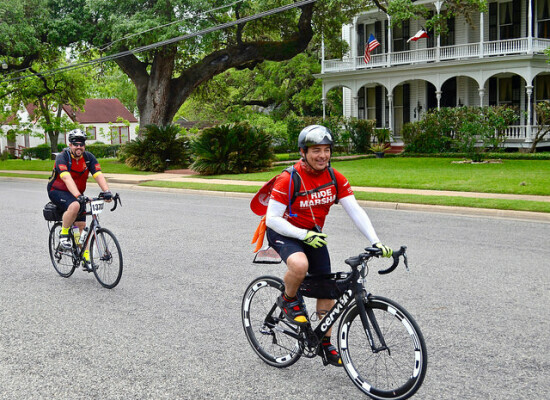 Several years ago, the Wells Fargo Bank team of about 40 riders began to stay at the parish hall, using the nearby junior high school showers. When there are more requests than the church can handle, they forward them to the nearby Presbyterian church. In the morning, after breakfast, the riders assemble for a blessing by the Rev. Eric Hungerford before heading out to Austin. Bailey agrees. “One of the perks of living in a small town is the sense of community. Some church members are on the boards of the local animal shelter and other local charities so we have a [built-in] group of community partners,” he said. The logistics of the event is mostly a function of St. James’ Men’s Club. “Our biggest challenge is getting lots of people to host. We get more requests than we have room for,” Bailey said. 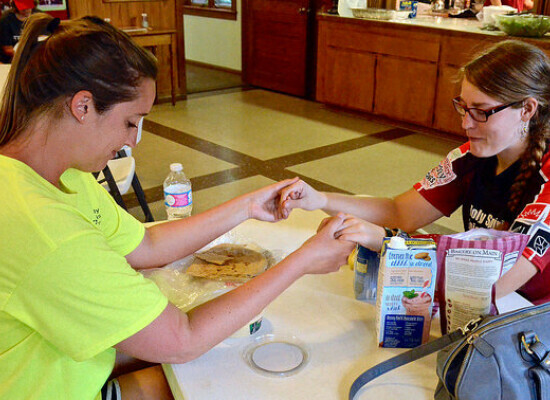 Besides the MS150, the men’s club hosts a monthly barbecue to support local charities. The church’s grill masters are known to the community as “The Holy Smokers,” and help sponsor rising musical artists at the monthly Fayette County Opry. They donated 83 barbecued turkeys to the Fayette and Bastrop counties crisis center in 2016 for needy families. 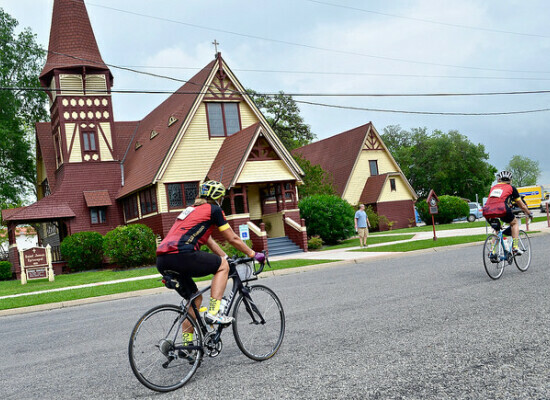 Between the MS150, monthly barbecues and a hot dog concession at the Round Top Antique Show, the St. James’ Episcopal Men’s Group raised more than $12,000 last year for the food pantry, a Santa program, an alcohol and drug rehabilitation program, and other local charities. 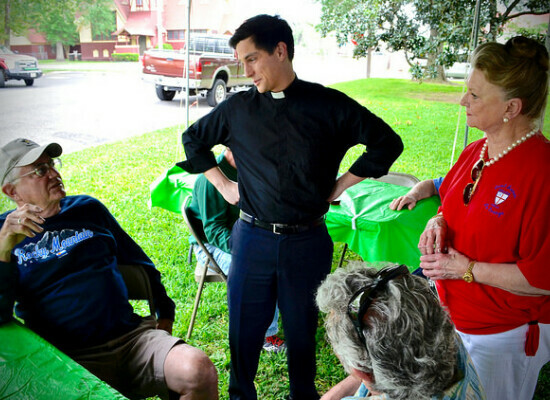 “If you ask most of our members who their best friends in the community are, they usually are other people in our parish,” Bailey said. “People would describe us as a family who are fairly energetic for our age and size.” The church’s supper club has 70-80 participants at its regular gatherings. The congregation has a full complement of talents to make all kinds of things happen. Many of the church’s members are former executives who have retired in Fayette County. Others have run refineries, know how to drive a bulldozer or have major carpentry skills. Several members personally did most of the remodeling on the rectory recently.